The last five years have been a time of considerable growth and accomplishment for the USC Norris Comprehensive Cancer Center. We have recruited many high quality investigators to our Cancer Center and have strengthened the integration of science and patient care. The USC Norris Comprehensive Cancer Center is situated in a large multi-ethnic region, an advantage we have exploited to develop our prowess in population-based research. Our Cancer Center has taken full advantage of these opportunities and has developed extensive population-based resources which have provided the backbone of our research in epidemiology and cancer control research. We have also made major inroads in the development of molecular epidemiology, giving us the opportunity to inject molecular science into this exciting research arena. Additionally, our Cancer Center has always had great strength in translating epidemiological findings into cancer control and prevention, and we have conducted pioneering studies on behavior and hormonal modification with the goal of reducing cancer risk. Members of our Cancer Center have also revolutionized cancer research with their leading work in the field of epigenetics. The last five years have been particularly gratifying in terms of scientific accomplishments. We have defined the molecular mechanisms for common breakpoints in lymphoma, established new susceptibility loci for prostate and other cancers and shown through GWAS studies that these are located in enhancers, seen the adoption of epigenetic therapy for myeloid dysplastic syndrome, completed a Phase I trial for fenretinide, completed a Phase I clinical trial on bisphosphonates in children with neuroblastoma, are pursuing a Phase I/II using anti-lL-6 mAb, and are currently actively pursuing the development of a new Wnt inhibitor which seems particularly promising in the treatment of colorectal and other cancers. Our future plans are to continue our participation in major national and international efforts in epigenetics and in molecular epidemiology, to pursue the development of molecularly targeted drugs and to continue the momentum we have established in the recruitment of physician-scientists and the expansion of our clinical programs to further strengthen our translational efforts. 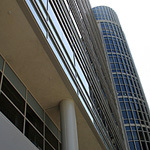 Completed in April 2007, the Harlyne J. Norris Research Tower is a 10-story, 172,000-square-foot building adjacent to the existing USC Norris facilities. This new structure joins the original USC Norris building, Ezralow Family Research Tower, and the Norman Topping Research Tower to complete a trio of structures that combine world-class research and leading-edge clinical trials with high-caliber, compassionate patient care. The new tower provides five floors devoted to basic research, two floors for preventive medicine research, an atrium with attached lobby, a conference center and a landscaped courtyard. The building is dedicated to the vision of the late Kenneth Norris Jr. - husband of the building's namesake - "to make cancer a disease of the past." Childrens Hospital Los Angeles has recently constructed a 460,000 square-foot, seven-floor, 317-bed building. Some say it is the finest medical and surgical environment for seriously ill and injured children anywhere in the United States. The new hospital at Childrens Hospital Los Angeles includes an Emergency Department; imaging facilities; a Cancer Day Hospital, with a 48-bed acute care Hematology/Oncology unit and a 14-bed Bone Marrow Transplant (BMT) unit; a 24-bed Cardiothoracic Intensive Care Unit (CTICU) and a 21-bed acute inpatient medical heart unit; a 24-bed Pediatric Intensive Care Unit (PICU); and a 58-bed Center for Newborn and Infant Critical Care (CNICC). There are 128 additional medical and surgical acute care beds.